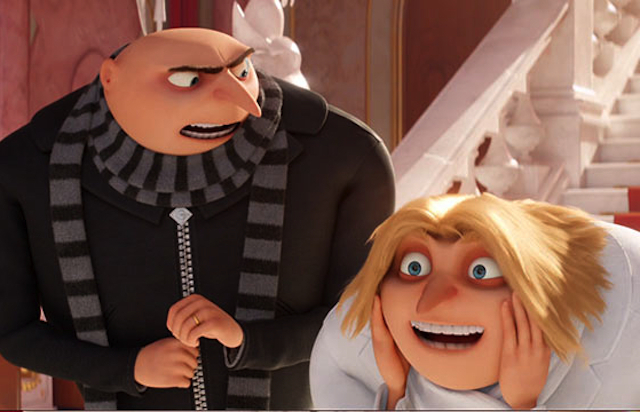 The movie starts off with Gru (voice of Steve Carrell) and his now wife Lucy (Kristen Wiig) being drummed out of the anti-villains league after letting a super villain named Evil Bratt (Trey Parker) slip through their fingers. Bratt was the child star of an 1980s sitcom who let his mischievous TV alter-ego go to his head after he hit puberty. Now I happen to love the 80’s, but every joke here is of the worn out seen it a thousand times before variety – starting with Evil Bratt’s hairstyle, which is part mullet part flattop. He’s decked out in shoulder pads which shoot bubble gum, and a moustache straight out of “Simon & Simon.“ There’s even an 80’s robot, but he’s not half as charming here as he was in “The Muppets.” The one saving grace is at least the movie gets good mileage out of its soundtrack including the predictable, but still reliable, “Bad” by Michael Jackson.